Varanis Courier is a common Agility creature card. It is part of the Core Set. 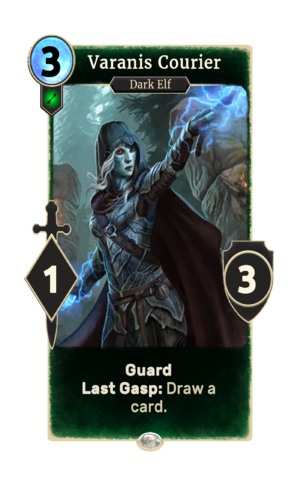 In addition to the card's availability in the Core Set, two copies are included in the Dunmer Avengers deck. "I will not waste words on one so ugly." "What color is a coward's blood?" "Take this, and make my death mean something." "I am defeated, this is yours now." The card is named for the Morrowind region of Varanis. This page was last modified on 16 February 2019, at 13:42.